Memory cards are so compact that unfortunately they can be easily lost or damaged. 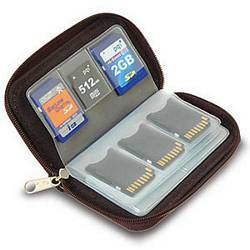 This anti-static memory card case keeps all your memory cards safely stored so you always know where they are. You won't be digging in the dusty bottom of your camera case or briefcase looking for your valuable memory cards anymore. Memory cards not included. Pros: Well made, especially for the money. It does get a little tight, but that's OK.
Cons: Pages are really sized for two different products, which seems a little silly to me. Most people are unlikely to have need for two sizes. To me, the BIG problem is that the unit is BLACK. Why is this a problem? What color is the inside of a camera case: Generally dark or black. In fact, what is the color inside most cases: Dark or black, meaning this little case, with potentially thousands of valuable images on it, can easily get lost. It would be a LOT better if it were available in fluorescent orange or fluorescent green, a screaming red, vivid polka dots, anything that stands out and is easily seen, or not seen if it is missing. I have equipped mine with some florescent cable ties, which help, but a bright case would be even better. Other Thoughts: In my use, the empty cards are stored face up, and used cards are stored face down. Seems to work for me. I also fit in a very small adapter that allows me to dump my SD cards to my laptop, which is great! Pros: I have 20 SD-sized cards (18 cards, 2 adapters - one Mini SD and one Micro SD) and the case zips fine. It's small enough to fit in a pocket or most small camera cases and leaves room for the camera. Definitely does more than what you'd expect for the price. Cons: I wish it had a clip or connector or some way to connect it to something. I've taken to putting a length of cord through the hole in the zipper tab and hanging it from that. Cons: main problem is that when you put the sd cards in and fill up all of the slots. it is impossible to zip up the case because it is too thick. I also do not like the fact that the compartments are geared for certain size cards and will not accept the larger cards in all the slots. I bought this to store Nintendo cartridges and the cards will only fit in 8 off the slots. Even with only having 8 cards in the case, it barely closes so I am not sure how you could get any more cards in there. The case is only 0.75 inches thick, and it includes stiffeners inside each wall. It's true, you won't be able to shut it if you fill every slot with an SD card. If you can use microSD cards in some of the pockets, you'll have better luck. We suggest that you upgrade to 215 0677, a larger memory card case from ZIOTEK. Please call us at 1.800.892.0164 to arrange an exchange. 15 out of 17 find this review helpful.